Olympics Met With Mixed Emotions By First Nations Organizers of the Vancouver Games have made a big deal of including Canada's native people in preparations for the Olympics. Some natives see themselves as full partners in the games, but others say the events are being held without their permission on what amounts to stolen land. 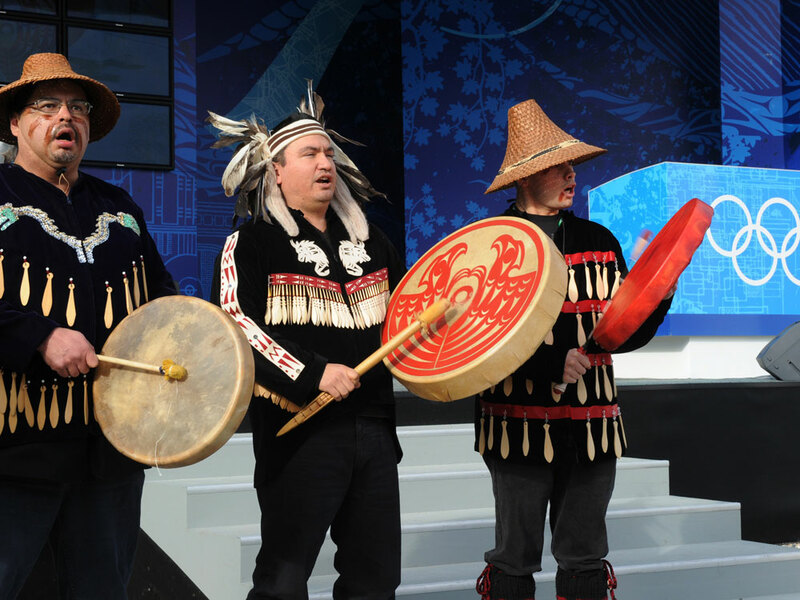 First Nation aboriginals perform for International Olympic Committee President Jacques Rogge as he tours the Olympic Village in Vancouver this week. Organizers of this year's Winter Olympics have made a big deal about including Canada's Indians, or natives, as they're called there, in preparations for the games. The four native bands closest to Vancouver and Whistler are official co-hosts, and native art is the basis for a lot of this year's Olympic merchandizing. But some native people aren't so happy about the partnership, and they are accusing their leaders of selling out. Last week, a small crowd of Canadian natives gathered in Vancouver to watch the dome of the "Aboriginal Pavilion" inflate. The structure will house a native arts and culture showcase and is situated on prime Olympic real estate, just a couple of blocks from the hockey arena. Tewanee Joseph is a member of the Squamish nation, which has land in and around the host city of Vancouver. From the start, he says, they've insisted on being full partners in the Vancouver Games. "Our chief said, 'We're not going to be just brought out for beads and feathers,' " Joseph says. 'This has to be real participation.' "
Joseph is CEO of the "Four Host First Nations Society," an entity created by nearby native governments to participate in the Olympic planning. He says the partnership has resulted in real participation. "We were part of all the discussions," Joseph says, "from governance to venues. Now you have the Aboriginal Pavilion." But just a few blocks from the Aboriginal Pavilion, it is easy to find natives who feel a lot less included. Rick Lavalle is upset over what he says is increasing police roughness with native panhandlers ahead of the Olympics. It's something he plans to protest Friday, during demonstrations before the opening ceremony. "I'm going to have war paint on my face and stuff like that," Lavalle says, "and I'm going to be marching with thousands of people in the streets!" But Lavalle is not just angry at the cops. 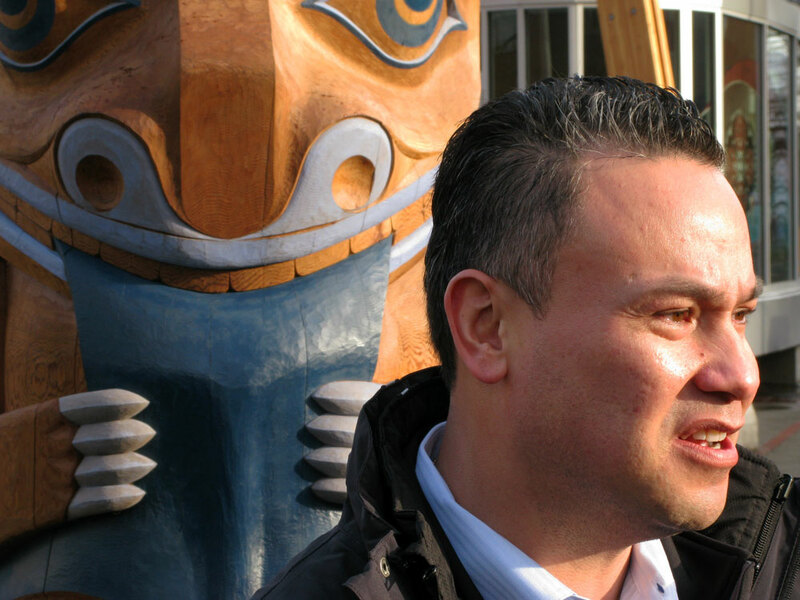 Like many natives who live in Vancouver's poor Downtown Eastside, he is annoyed by the Four Host First Nations' cooperation with the Olympics. He believes that the money tribal governments are earning on Olympic business has bought their silence on long-standing grievances. Chief among those is the unresolved legal status of native land. Tewanee Joseph is CEO of the Four Host First Nations Society, the entity created by the four native groups whose traditional land is the site of the 2010 Olympics. Stewart Phillip, president of the Union of British Columbia Indian Chiefs, says his people still retain rights to the land that the Olympics are being held on. "British Columbia is unceded indigenous territory," Phillip says. "Unlike the rest of Canada, we have not entered into nor have we signed treaties, and therefore we still enjoy unextinguished aboriginal title to all the land and resources of British Columbia." To some, this means the Olympics are being held on stolen native land. But Phillip says if the Four Host First Nations want to allow the games on their land, that's their right. Not that he's happy about it. His organization has kept its distance from the Olympics, and he's even refused to take part in the tribute to native culture in Friday night's opening ceremony, which he calls "Disneyesque." "I don't think it's proper for me to stand there and hold hands with government officials and be part of the misrepresentation of the well-being of our people," Phillip says. Like American Indians, Canadian natives suffer from high unemployment, chemical dependency and family breakdown. But some say there have also been improvements, including more cultural respect from the Canadian government. Alice Guss is the great-great-granddaughter of Chief Joe Capilano, a Squamish chief who famously traveled to London to plead his people's case with the British government. A century later, Guss says native participation in the Olympics is part of what she calls her people's "healing journey." "It's a positive thing for us; it's a once in a lifetime," Gus says. "And it's bringing back a lot of the teachings in our communities, and our children are dancing, and it's just awesome." Guss lives near the Sea-to-Sky Highway, the road to Whistler that was recently rebuilt for the Olympics. The project was controversial, because the road is on native land, but Guss says even there, the government tried to be sensitive. There are big new stone highway signs, with place names written in the original Squamish language. Guss likes that touch. She says it lets Olympic visitors really know where they are.